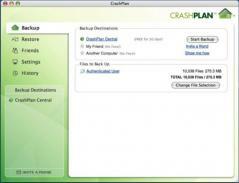 CrashPlan PRO provides an easy way for businesses with limited IT resources to quickly back up their computers and devices both online to PRO Cloud and locally to attached drives. The solution includes a desktop client that is installed on each computer and a web-based management console that admins can use to manage backup for their company. This application combines the versatility of home backup solutions with the sophistication of online management apps to obtain a rich business backup feature set. NOTE: You need to create a trial account in order to be able to use CrashPlan PRO. - Engineered for laptops, there's more to CrashPlan PRO than just a pretty face. - Serious business backup that delivers everything your users want and everything your backup needs.